If a dramatic election happens and no one votes, does it still mean the electorate changes to purple? The finger pointing over who was to blame for Tuesday’s devastating losses started as soon as the polls closed – maybe even before in places like Colorado and Kentucky, where flawed campaigns and unforced errors by candidates killed off an incumbent and skewered a rising star. But Democrats and political analysts all realize that, for the most part, it wasn’t the candidates. It wasn’t the message. It wasn’t the low approval numbers for President Obama in states that could have been in play, or the billions spent by outside groups to link Democratic candidates to him and the majority leader. It was the voters – those who chose to show up and those who stayed home. As Politico rightly points out, the president’s choice of words indicate he doesn’t see the Republicans’ big night as any kind of mandate from the people, since it’s only a third that chose to have their voices heard. A lopsided third, but a third nonetheless. Who showed up? In Georgia, even with a turnout that was better than the national average, at just under 50 percent, neither young folks nor minorities voted in sufficient numbers to achieve the results Democrats were looking for. It was older white people who did their civic duty. According to exit polling reported by ABC News, only 13 percent of those under 30 voted nationally, down six points from the way they turned out in 2012. Yet in the Peach State, 59 percent of that demographic went for Michelle Nunn. But the real damage to the Nunn and Jason Carter campaigns came from a lack of African American voters both registered and at the polls. While African Americans accounted for nearly 30 percent of the Democrats’ tally in Georgia, it was only about the same as the numbers who voted in 2012. In order to win, there had to be an increase in voter registration of a half-a-million voters. Voter registration groups were only able to garner 85,000. Why were so many needed? “The pros estimated they needed 500,000 new black voters in order to get 200,000 to the polls,” reports Walter Jones of Insider Advantage. While volunteers were using Obama-proven targeting methods to make phone calls and knock on doors to motivate people to vote, it just wasn’t enough. “Some of my biggest, hottest precincts, there was no activity, no street corner activity, no poll activity,” lamented State Sen. Vincent Fort (D-Atlanta) to the AJC. “They were running an Obama-style campaign without Obama. It’s like doing ‘Othello’ without Othello.” Or an audience. 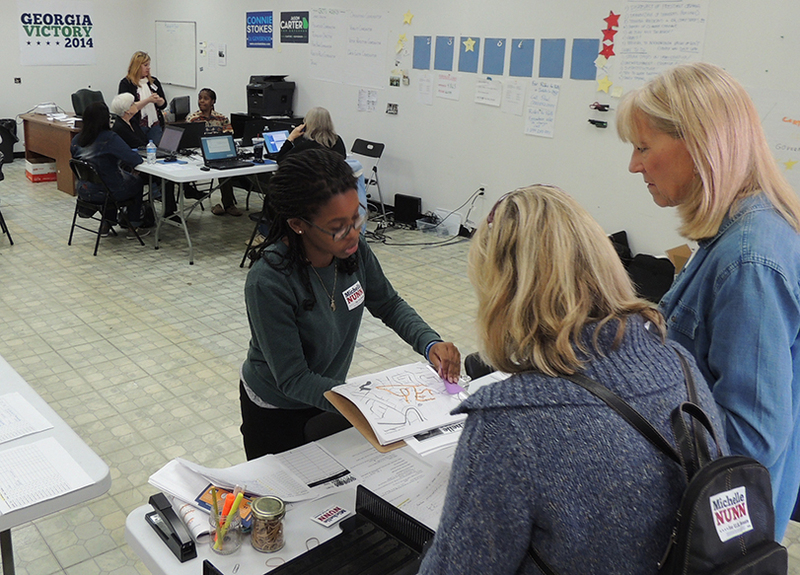 In the end, Michelle Nunn was only able to capture 23 percent of the white vote. Their estimates said they needed to capture at least 30 percent. Republican David Perdue took 70 percent. Seventy. The goal remains to expanded the voter rolls for 2016, so the state can make a tectonic shift and awaken from this apathetic slumber. Two years is not a lot of time. Before the next state legislature convenes and tries to limit voter registration, we need to go back out there and get more than 500,000 new voters registered. Two years, starting last week. Go. PG, I was curious to read your thoughts after the most recent election. I will make a few comments in no particular order. Perhaps the Democratic party in Georgia should note that it wasn’t just the “two headed albatross” that doomed Nunn, it was the poor strategy of selecting a candidate with no experience in business or any other real enterprise. The electorate was tired of an empty suite campaign with nothing to offer but a last name. President BHO’s comment noting that he heard the two thirds of voters who chose not to participate in the process was a telling remark. Elected officials have an obligation to represent the people who voted, period. The President is showing a disdain for our electoral system and it showed in his first press conference after his policies were trounced. The portion of the population in our system that chooses not to vote have no voice, period. This includes any non citizen, non registered voters and citizens who choose not to be heard by not voting. Your notion that only if more people register, more Democrats will be elected is misguided. Although, I am in favor of all citizens making the effort to register to vote, I am aware that elections are won by voters. BHO won two elections with fewer registered voters than today. Tuesday’s election was based on the current Presidents failed policies and that should be the message to the House, Senate and the Executive branch. By the way, with all your statistics on turnout, I believe that nationally, more blacks, Latinos and Asians voted republican than in previous elections as a percentage. This is another indication that policies not race were on the agenda for the voters. Although I could continue to comment, my final note is that your quotes from Landrieu and Schaeffer are laughable. You are aware that Schaeffer has made of career of changing his position on all kinds of issues. He will say anything to get in the press. He has no real core to his beliefs. He is no authority on race in American politics. Landrieu is a white woman representing a state with a large black minority.